Mom, the one who fixed things, made sandwiches, and put the house back together when we wrecked it, needed me and I couldn’t help her. When I was growing up, my parents’ marriage was pretty traditional. Yet today, my brothers and I all cook and help out around our houses. I also do all the shopping because I’m a control freak about the kitchen (my wife is wonderful, but every time she goes to the grocery store she comes home with three different kinds of hummus and pita, a nice bottle of Chianti, and some Ziplock freezer bags, but nothing for dinner). One of the things that made me a feminist was seeing how much my mom struggled after she had a horrible accident when I was a kid. 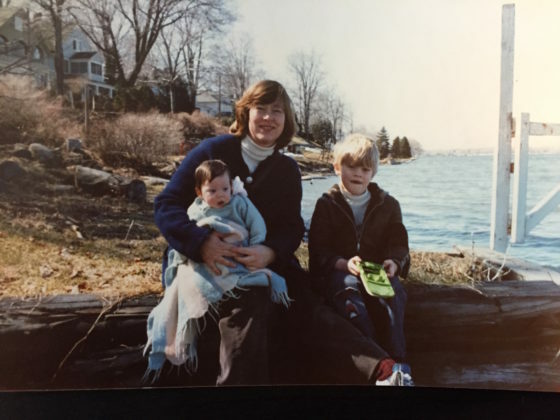 In the early ’80s, my parents bought a cottage on Chautauqua Lake in Western New York. They spent the summers fixing up the little red house, putting another coat of paint on the porch or raking up grass while my brothers and I ran under shady oaks and swam off the docks. My brothers and I helped sometimes, but we didn’t understand why a vacation home was a place to work on the weekends, so we stayed busy outside to keep from getting conscripted. Where the front door should have been, the house had a single window facing the street. Through the side entrance, the narrow floor plan sacrificed hallways to eke out a living room, kitchen, and two bedrooms. The bunkroom off the kitchen where we slept was like camping indoors, with moths camouflaged against the wood-paneled walls and centipedes ready to run across your feet when you went to the bathroom. We took turns breaking up cobwebs with the broom in the corner. The screened-in front porch, the waves slapping the shore, big front yard, and sandy shoreline more than made up for it. One morning, Mom stood on a ladder and cleaned the gutters while I hunted spiders. Using an old dog food container she had washed out, I scooped up daddy long legs with my bare hands, dumped them inside, and squeezed the lid back on to keep them from climbing out. Dad was working at home in Cleveland and my siblings were playing or napping. I heard a sudden crash and ran out of the pump shed. In a freak accident, the extension ladder had collapsed and the sharp end of it had come down on her foot. Mom was lying in the driveway with her ankle split open. Blood poured out onto the cracked pavement and mixed with the dirty leaves. I saw a jagged white bone sticking out and realized Mom’s foot had nearly been severed from her leg; the only thing holding it on was a ribbon of flesh and sinew. I’d been stuffed inside a scene of TV violence, something that only happened in R-rated movies I wasn’t allowed to see. “Mom! What should I do?” I cried. “Lee, call the Holmbergs!” she growled. They were our neighbors down the street. Jerking to life like a wind-up toy, I yanked open the screen door and grabbed the rotary phone off the wall. My fingers felt thick and sticky and I couldn’t remember the number, so I ran back outside asking for help. The last thing I saw was her lifting herself up on her one good leg and dragging her ankle toward the door. As I ran up the driveway to the street, I felt like I was wading through water, moving slowly like in a dream. Mom, the one who fixed things, made sandwiches, and put the house back together when we wrecked it, needed me and I couldn’t help her. When I got to the Holmberg’s, I knocked and yelled but no one came. At home, there was an ambulance in the driveway and my brothers were standing there with stunned looks on their faces. As it pulled away, I thought about the possibility that Mom wouldn’t come home. Who would make dinner? The only thing Dad knew how to make was hamburgers, and we didn’t do takeout. I also worried irrationally that it would be my fault the bloodstained carpet was ruined. Money doesn’t grow on trees, Mom said when we begged for new toys at the store. It was one of her many folksy sayings, along with You were in Halifax chewing Beeswax, which means “before you were even thought of” according to Mom, and often referred to her college boyfriends before she met my dad. Mom was rushed to Jamestown Community Hospital, where the doctors managed to save her ankle. The Holmbergs came over and stayed with us while my dad drove up from Cleveland. Dr. Holmberg sat us down on the couch and told us that Mom would be able to walk again, but her days of running or playing tennis were over. She arrived home in a family friend’s station wagon a week later. She was 36, with pretty, auburn hair, but she looked 10 years older. I remember the sliding door opening and seeing her in a hip-length cast with a set of wooden crutches folded beside her. As she hobbled up the steps with a determined grimace, leaning on my dad’s arm for support, he told us we’d need to help, and we listened without fighting for once. My parents hired someone to help out around the house and take care of us that summer, but things were chaotic. My brothers and I learned to be useful by setting the table, washing the dishes, and making our lunches, but it wasn’t easy. Dad helped out, too, but when he unloaded the dishwasher and put the cereal bowls away wet, it confirmed Mom’s view that he should just stay out of the kitchen. Sometimes we acted like little jerks and didn’t listen to her. However, my gut knotted with empathy as I watched my mom, who had sacrificed her body over and over again for our family, awkwardly navigate around corners on her crutches or struggle to boil a pot of water to make dinner. She hated being in a cast and was in constant pain. I’d never seen her so helpless or depressed. Yet her determination, upbeat attitude, and sense of humor were an inspiration that stayed with me for the rest of my life. After the accident, we never really talked about what happened. Mom’s gory ankle lived in my head for years. Her recovery was slow and painful, more so because my brothers and I often misbehaved. Yet after the summer was over, my parents got rid of the babysitter and I began helping Mom shop for groceries during my lunch break from school. A year later, she was washing screens and running power tools just like before. Lee Chilcote lives in a 1900 Victorian in Cleveland, Ohio, with his wife, Katherine, and their three children. His writing has appeared in Vanity Fair, Next City, Planning, and other publications. His chapbook of poems, The Shape of Home, was recently published by Finishing Line Press. He is founder and executive director of Literary Cleveland.